Holy Eucharist Rite I, 7:30 am. This is a traditional service without music. 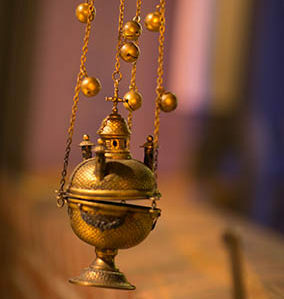 Holy Eucharist Rite II, 10:00 am. This service is accompanied by a choir and music. Following the 7:30 am and 10:00 am services, a coffee hour is hosted in the Guild Hall by one of the members of the church. Coffee, both regular and decaf, is served, along with little treats and goodies. Sometimes something simple is served, like cookies and muffins, while other times there’s quiche and fresh fruit! Our Nursery for children three and under opens at 9:50 am in the Guild Hall. 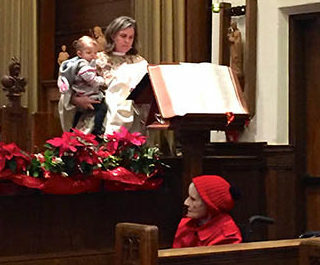 Children of all ages are always welcome in our services and encouraged to sit towards the front so they can see and participate in the “action” of the liturgy. Pick up a Worship Bag as you enter to take with you to the pew. Ask a greeter to help you find one. These bags have crayons and kid bulletins filled with activities to keep kids engaged and interacting during worship. Feel free to enter and exit the sanctuary as needed. If you would find it helpful, bring a small toy and snack with you into worship. During the sermon children are invited to recess to the Guild Hall for a Godly Play lesson. They will re-join the congregation for Holy Communion. Youth and Adults are invited to serve as accolytes, readers or intercessors. Where ever you are on your faith journey, St. Luke’s wants to welcome you. Whether you’re looking for a spiritual home, just visiting, or even if you’re curious, please stop by, say hello and join us.